We here at the Tree of the Golden Light extend our warmest Thanksgiving thoughts to all of you. 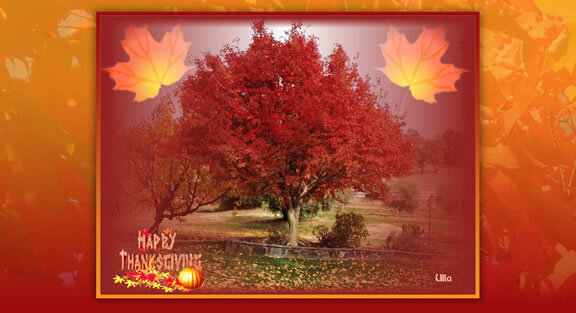 We thank you Ulla for this beautiful image for a Happy Thanksgiving. We extend our thanks to those in this country who stand together, and support our rights and live the dream. We extend our thanks to those in other countries for the feeling of family we receive just knowing you are there in love and co-operation. We extend our thanks to those who are in the Inner Earth and Hollow Earth lending their knowledge, support and love to us throughout our time on this wonderful planet. We extend our thanks to those who reside in our solar system, other galaxies, indeed in the whole universe for being a part of this incredible, united family of Creation. As the day progresses it is like an answer to a prayer for the coming together of Universal Family at the table of community. We in this household will be going forth into our community of Mt Shasta and sharing the bounty of the dear people who live here, as they bring themselves together from all walks of life, all systems of belief on this day of celebration in the manner in which the feeling of community is lived. We are all One! We come together once a year in this country of the United States of America, and extend our Thanksgiving to all of the rest of our world, from the first beautiful natives of this land to the rest of humanity, as our adventure of living this dream continues into it’s final stage. As the feast is brought to the table and we all partake of the treasures that are offered for our sustenance, we turn to one another and give thanks in love for all that has been shared in the years past, and in the time to come. We recognize the love and power of the freedom that is expressed as we sit together and share our warmest inspirations for the Truth of what we are living. It is a Thanksgiving Day that lasts into infinity and beyond. It is Us being United, all in the name of Love.